Perhaps you’re single, a college student, widowed, or empty-nesters. Cooking for one or two people can be difficult. Most recipes are developed for four or more. Therefore, we tend to waste food, or get bored with eating the same thing. Then add on the healthy component which possesses its own set of challenges. People believe it’s too expensive, disgusting, are scared to try new items, or lack support from family and friends. Instead of resorting to an unhealthy lifestyle, prepare foods that are nutritious, quick to fix, and reduces your food waste. 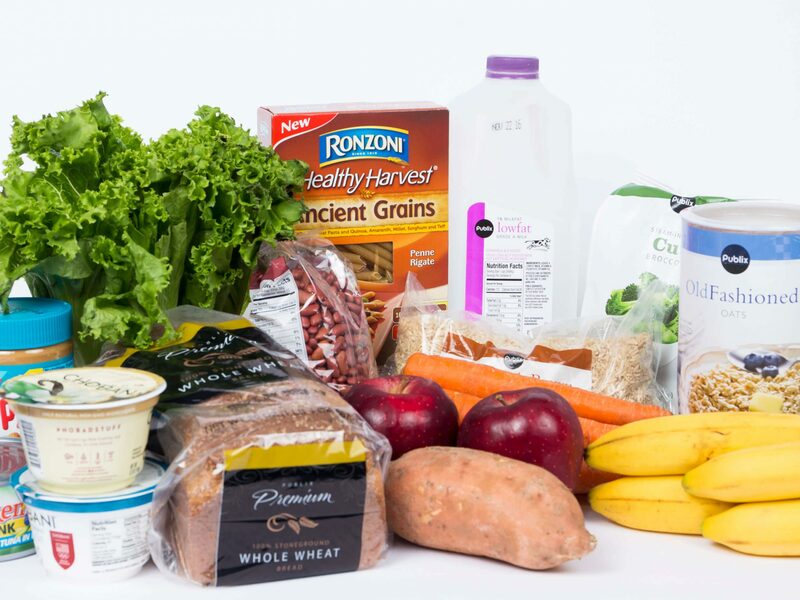 With help from MyPlate (a tool created by the USDA to improve the nutrition and health of Americans) use these tips to prepare healthy meals for one or two. Grains can be purchased in bulk which can be cost-effective. Oatmeal, rice, quinoa, and pasta have extended shelf life, are quick to prepare, and are easily broken into smaller portion sizes. Breads and rolls can be placed into the freezer and individual pieces can be thawed slowly or defrosted in the microwave. This will help preserve your bread and reduce waste. When buying grains, try to make half your grains whole grains. Whole grains provides dietary fiber which can reduce cholesterol, lower risk of heart disease, helps with bowel function, and keep us full. Fresh fruits and vegetables should be purchased in small amounts or in various stages of maturity. Purchase some that are ripe which can be consumed now and some to ripen for later. You can freeze fresh produce to use later in smoothies, soups, stir-fry, or pasta dishes. Frozen/ canned fruits and vegetables are great for those that do not shop frequently. However, refrain from items with added sugars and sodium. It’s important to include fruits and vegetables when creating a healthy eating pattern. Myplate recommends to make half of your plate fruits and vegetables. They are naturally low in fat, sodium and calories. They do not contain cholesterol, help reduce your risk of heart disease, heart attack and stroke, and may protect against certain cancers. When selecting protein, ask the butcher to repackage the meat for one or two pieces. If you prefer to buy in bulk, separate the meat into one or two portion sizes then freeze for later. Make sure to vary your protein with lean meats, skinless poultry, seafood, eggs, beans, soy products, nuts and seeds. Try to consume seafood twice a week. For example, canned tuna is a nutritious and inexpensive option. Avoid breading, frying, or using heavy gravies and sauces. When purchasing dairy, such as milk, buy a pint, quart, or half a gallon at a time. Try switching to fat-free or low-fat dairy products. They offer fewer calories and less saturated fat while having the same amount of calcium and other nutrients when compared to whole milk. 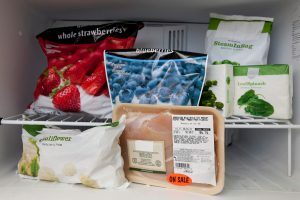 Healthy options for the freezer. Convenience is a major factor when making food selections. Some people resort to unhealthy canned or frozen meals, fast-food restaurants, or junk food because of time restraints, lack of cooking skills, or the clean-up that comes after cooking. Remember to simplify when cooking for one or two. Think easy to prepare, try a no cooking option, or scale down your cookbook favorites by cutting the recipe in half. In order to avoid eating the same thing time after time, find multiple ways to prepare your meals. From a whole chicken, you can prepare stir-fry, chili, burritos, pasta, or soup. This prevents boredom and adds variety to your meals. It’s important to have basic kitchen equipment that are easy to use convenience items. Microwaves are quick and provide multiple cooking functions. Food processors can help chop or mince food quickly. Blenders can make quick and healthy breakfast smoothies. Instant-read thermometers help prepare food to the correct temperature. Whatever appliances you decide to use, remember to choose appliances that will fit your needs. Most importantly, remember to enjoy your meals. Savor the flavor, add texture, color and variety. Have some fun, try a new recipe, and invite a friend over so you don’t have to eat alone. Cooking for one or two does not have to be difficult, you can always enjoy healthy and delicious meals at home. Still don’t believe you can prepare healthy meals? Join us for Healthy Cooking for 1 or 2 from 10 a.m. – noon on Tuesday, Oct. 31 at the Lake County Extension Center, 1951 Woodlea Road, Tavares. In this hands-on class, participants will learn how to downsize and simplify meal preparation without sacrificing flavor. The $10 registration fee, which includes food, printed material, and recipes, is required before Oct. 27.